Lies , damned lies and Google Analytics. Does your SEO company give you access to your websites statistics? Do they provide a clear explanation of what type of information is available when a visitor clicks on or arrives at your website ? 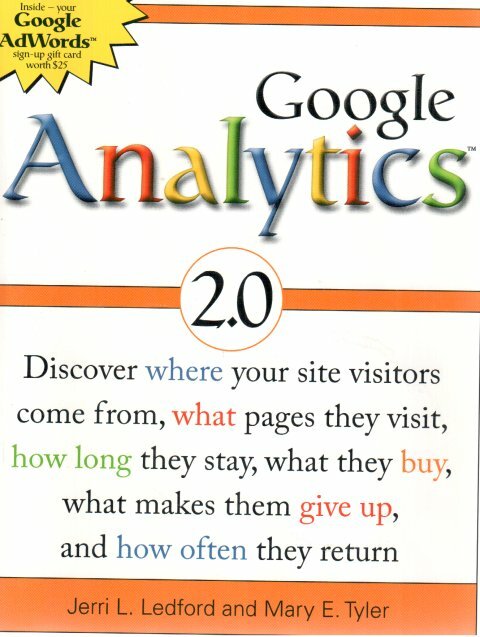 Google Analytics from Mary E Tyler and Jerri L Ledford is 300 pages of chapter by chapter feature and functionality breakdown of the Google Analytics service. Whilst this book will not make you a Search Engine genius it will give you the insight and the guide to accessing Googles powerful and web statistics tool. The book walks through the menu structures of Google Analytics and goes on to describe, in detail, what you might expect to achieve in utilising those features. The content is straightforward although you could read the help and tutorials available from Google and get similar advice. Having the book to hand will push your expectactions of what you could, or should, be acheiving with the statistics of your website. Of the books on my reference shelf its one of the more frequently accessed at the moment. I would certainly recommend it to anyone considering investigating their own Web analytical work or planning to purchase the services of a Search Engine Optimiser. ← A Search by any other name would be so Tweet. Does the book explain how accurate the data that google captures is? Gareth , ironically no it doesnt go into this in depth but in the opening of chapter 2 it refers to this as nitpicky issues. for the sake of generality though its enough to assume that the majority of users are interested in the majority of users. I too have noticed difference in states between Mybloglog, Lijit and Google Analytics and the Log files.